CAPTIV800 Encapsulation Cleaner is a highly effective, deep cleaning formulation that removes stubborn dirt, oily soil, and tough stains. CAPTIV800 dries quickly after application leaving no sticky residue that can accelerate re-soiling. CAPTIV800 is based on a special encapsulation/anti-soiling technology that continues to work after the surface dries to protect and to improve soil removal with the next vacuuming/mopping operation. solution, test the product on a concealed small area of rug. EXTRACTION CLEANING: Dilute 2-3 oz (60-90 ml) of CAPTIV800 per gallon (3.78 L) of water (1:60 to 1:40) and follow the machine directions. 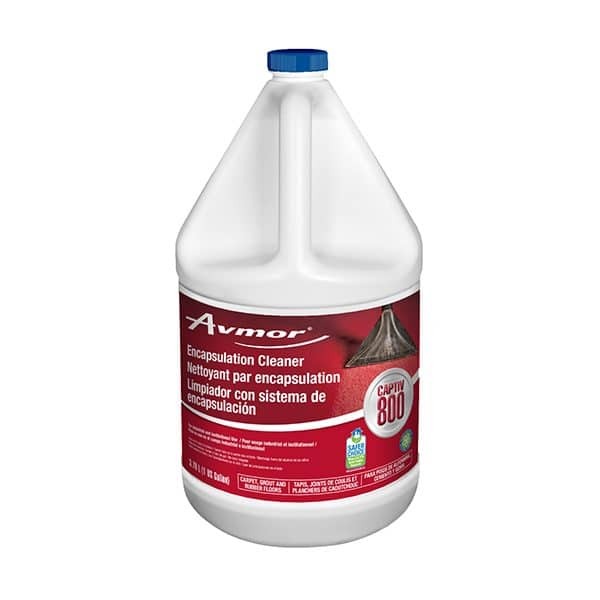 BONNET CLEANING: Dilute 3 oz (90 ml) of CAPTIV800 per gallon of water (1:40). Spray the solution over an absorbent bonnet and the section of carpet to be cleaned. Use Fas-Trak’s Bonnit Brush for best results. SPOT CLEANING: Dilute 8 oz (240 ml) of CAPTIV800 per gallon of water (1:15) into a spray bottle. Apply directly to the spot, place microfiber cloth on spot and use body weight (foot pressure) to absorb spot into the microfiber. Repeat as required to remove stain. We recommend Fas-Trak’s Bonnit Bug for efficient spot removal. GROUT & KITCHEN FLOORS: Dilute 4 oz (120 ml) of CAPTIV800 per gallon (3.78 L) of water (1:30). Pour directly on grout to be cleaned. Agitate grout with nylon bristle brush. Pick up soiled solution with wet/dry vacuum. Allow to air dry. For larger areas, use autoscrubber or single disk rotary floor machine affixed Fas-Trak’s Scrub Brush for best results. RUBBER FLOORS: Dilute 2 oz (60 ml) per gallon (3.78 L) of cold water (1:60) of CAPTIV800. Mop or autoscrub the floor. For stair treads, use nylon hand brush to agitate solution and pick up with wet/dry vacuum or microfiber cloth. Allow to air dry.